Why I am rooting for the Patriots declared that, for now, I am switching allegiances from the Buffalo Bills to the New England Patriots. 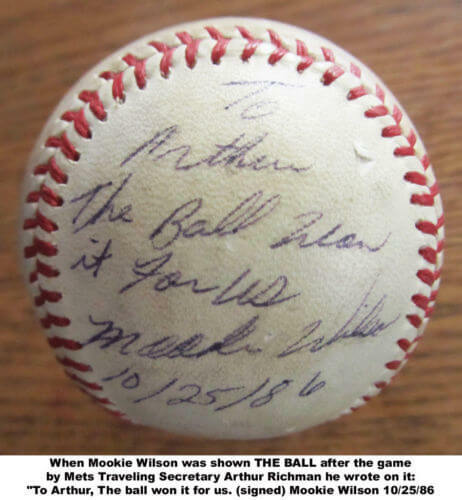 Expecting accusations of being a turncoat and a Benedict Arnold, I provided evidence — and provide more now — that the switch was not merely a bandwagon stunt. Rather, I have Patriot lineage in my football blood. 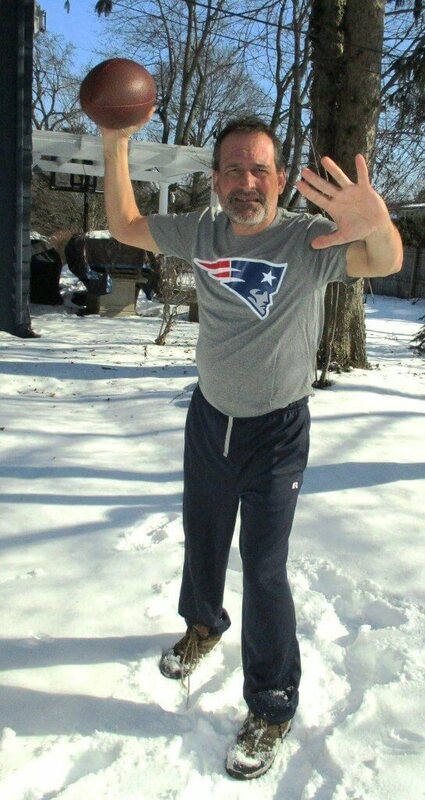 Motivated by my rooting, the Patriots have advanced to the Super Bowl. Not that I don’t feel guilt. Over the years, I’ve been with my friend Dean to two Bills games at Ralph Wilson Stadium, a session at the Bills training camp at St. John Fisher College and shared innumerable wings at the Elmwood Inn back in the day when the Bills were good and the wings were twelve for a buck fifty. So I must live with charges that I am a traitor. 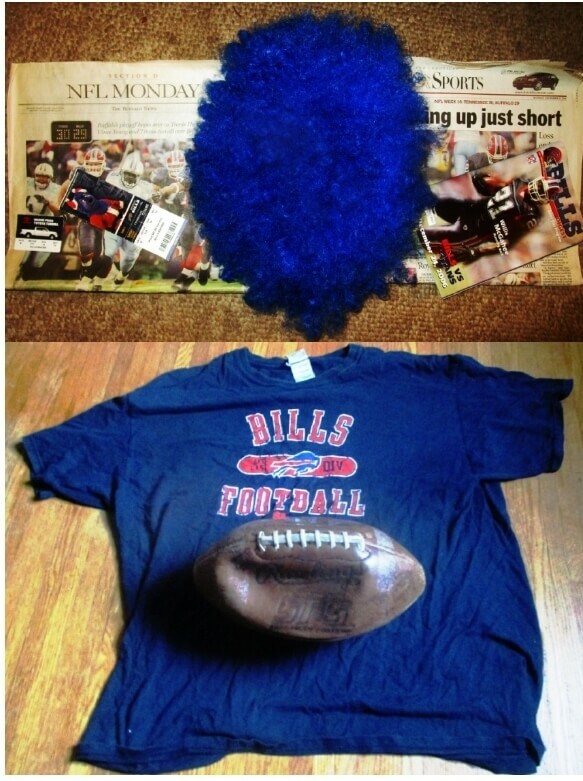 (top) Newspapers (Buffalo News, Rochester Democrat and Chronicle), tickets, program, and blue wig from the Christmas Eve 2006 Titans v. Bills game at Ralph Wilson Stadium. From Why I am rooting for the Patriots (bottom) Jack the Ball Dean and I brought to training camp to be signed by the Jills. T-Shirt donated to Talker by Dean. Suddenly, I am feeling guilt. From Despite the lifting of the curse, Peterman and the Jill-less Bills drop the ball. EXHIBIT A: The Patriots were once my secondary team. In the 1970s, as Sunday afternoon football was not a ritual in our household, often I went around the corner to my friend Billy Swift’s house where every week the Minnesota Vikings were paid homage. 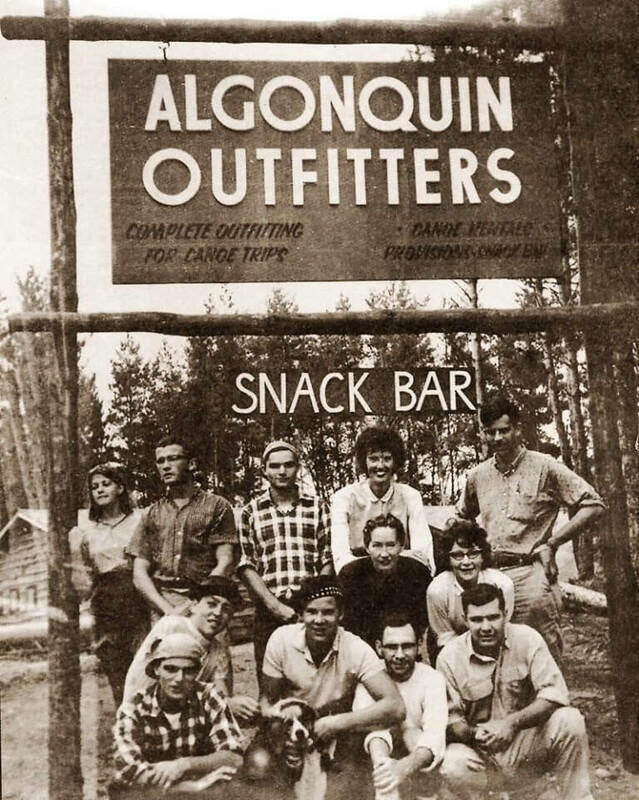 Bill Swift Sr., better known as Swifty, manufactured and outfitted canoes and kayaks in Canada, driving back and forth between Rochester and Ontario, strapping the canoes to his truck like a hunter transporting freshly harvested game. 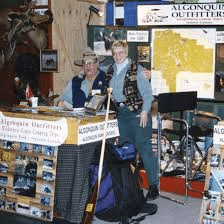 After Swifty died relatively young from a heart attack, Billy inherited the family business and now lives in Algonquin National Park. 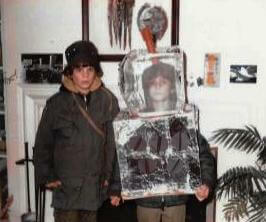 Billy Swift (left) with David Kramer, Halloween 1972. In his living room, Swifty installed two huge color televisions cradled inside fake wood panels. Back then, tv remote control did not exist, necessitating the duel monstrosities — antediluvian quality by today’s visual standards — capturing each moment of simultaneously broadcasted games. Sometimes, Swifty would blare Buffalo Bills games on the radio. On the occasions when three games might briefly be on at once, in reserve he had a black-white tv equipped with a funky antennae made from a clothes hanger and aluminum foil. Maybe because of his northern affinities, Swifty was a diehard Vikings fan, wearing his purple and yellow jersey as he channeled Tarkenton and Foreman and the Purple People Eaters. Perhaps because of his calming time spent in nature, Swifty never raved or screamed at the television. A large but athletic man — today we might say obese — Swifty placidly but intently watched every play while munching on his wife Wendy’s delectable but fatty spaghetti and meatballs drenched in cheese while sipping a few Molsons with his dog Tippy at his side. Zen-like, when the games were over, Swifty switched off the tv’s, finished his greasy meatballs and carbohydrate-laden Molsons, never mentioning football until the ritual began the next Sunday. At the time, I was most enamored with the great Steeler and Cowboys dynasties, but the Patriots were my secondary team. As the Patriots were in a different conference from the Vikings, the Swifts indulged my rooting interest. In the five years I rooted, the Patriots were a tease team. Their overall record was solid at 50 -26, but won their division only once and never advanced beyond the Divisional playoffs. On Patriots’ message boards, fans still relive the outrage of the dubious and infamous roughing the passer call in the 1976 Divisional playoff against the Raiders. The penalty allowed Ken Stabler to rally Oakland to victory in the 4th quarter. Many believe the football gods ruled in favor on the Patriots in the notorious 2002 tuck game as recompense for the bad call against Hamilton. My favorite defensive player was Raymond Clayborn who today would be considered a premier “lock down” corner. In 1978, the NFL limited contact on receivers making it easier to break free in the open field. Despite the rule changes, utilizing a bump-and-run strategy, Clayborn became extremely proficient in man coverage, using his taller frame to throw receivers out of sync, demonstrating his aggressive nature by getting right in receiver’s faces causing them to lose their poise. On offense, wide receiver Stanley Morgan took advantage of his exceptional speed and the new rule to become one of the league’s top deep threats. He and quarterback Steven Grogan were among the most prolific QB/WR duos of all time. From 1977 until 1989, Grogan and Morgan combined for over 530 receptions, 10,300 receiving yards while scoring nearly 70 touchdowns. 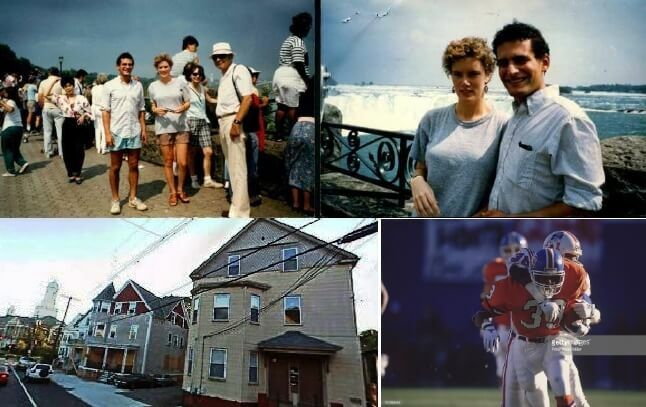 (top) David and Daphne at Niagara Falls, August 1989; (bottom left), 366 Hope Street, Providence, RI; (bottom right), the December 17th, 1988 New England Patriots – Denver Broncos game) In 1988/89, Daphne and I lived on the third floor of an apartment overlooking the Chabad of Providence. While we respected the commitment of the families to the Jewish faith, their sexist practices in which the women were cloistered with the children in the backyard was unappealing. Once or twice — to tweak the elder’s sensibilities — I and Daphne (she a schiksa!) made out in the living room where we could be observed. We watched the Denver Broncos beat the Patriots at Mile High Stadium in what would be Tony Dorsett’s final game. The loss ended the Patriot’s chances for a Wild Card berth. 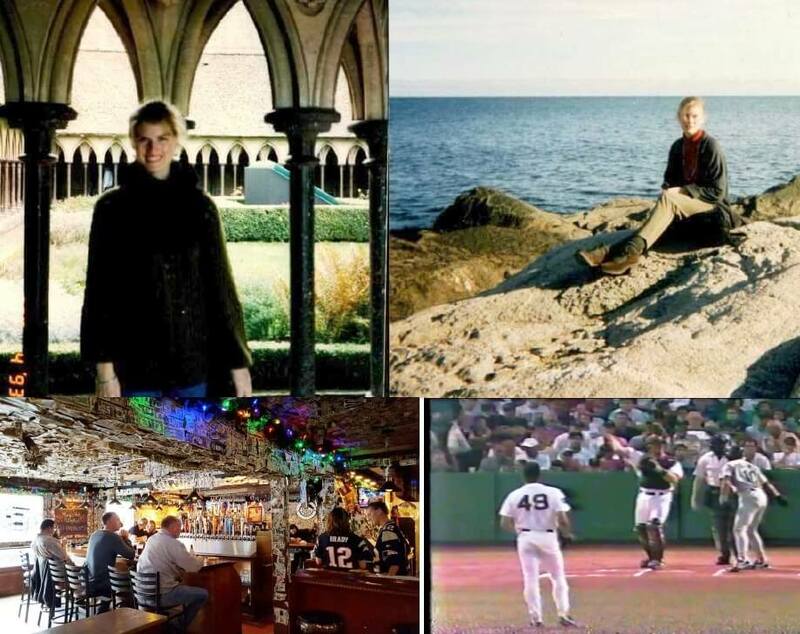 (top left) Shawna at the Abbey of St. Michel, France, April 1994; (top right) Shawna on Ocean Road, Narragansett, RI July 1994; (bottom left) The Mews Tavern, Wakefield, RI; (bottom right), Seattle Mariners vs. Boston Red Sox, July 8th, 1994. I met Shawna in 1992 in Professor Robert Baker’s Victorian Literature course at the University of Wisconsin-Madison. I was in the English master’s program and she was an English major graduating senior. A gifted writer, Shawna was an editor for the undergraduate literary magazine, The Madison Review. In 1994, Shawna interviewed for the master’s programs at Boston College and Northeastern University. Her trip included visiting me in Wakefield, RI. One night, we ate at the Mews. I distinctly remember watching part of the Mariners-Red Sox game because it was Alex Rodriguez’ major league debut. Already, Rodriguez was destined for greatness. 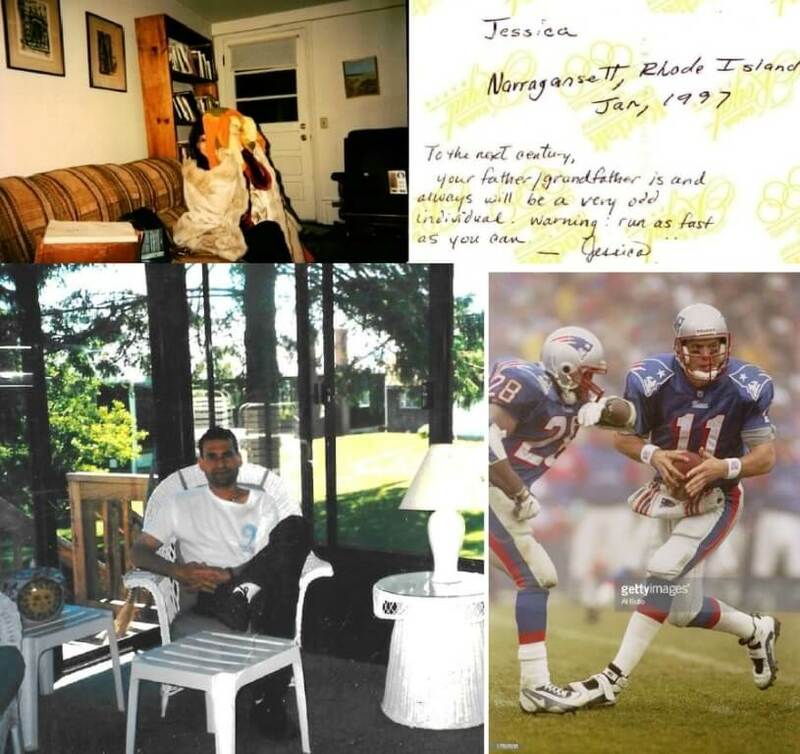 (top) Jessica at 7 McMillen Way, Narragansett, RI, January 1997; (bottom left) the beach house in the Spring; (bottom right) 5 Jan 1997: Quarterback Drew Bledsoe #11 of the New England Patriots looks to hand the football off to running back Curtis Martin #28 during the Patriots 28-3 win over the Pittsburgh Steelers at Foxboro Stadium in Foxboro, Massachusetts. I met Jessica at the University of Rhode Island when I was in the English PhD program and she in the English MA program. Occasionally, Jessica visited the beach house to brainstorm ideas for her Shakespeare class given by Professor Walter Barker. One time I asked Jessica to leave the future a message on the back of a photograph. A native Rhode Islander, Jessica is a big Patriots fan and we watched New England beat Pittsburgh in the AFC Championship game. I met Helen at the February 1997 Twentieth Century Literature Conference held at the University of Louisville. That summer, for her dissertation at Louisiana State University, Helen visited Rhode Island en route to interview Ellen Bryant Voigt, a former Poet Laureate of Vermont who taught at Goddard College. 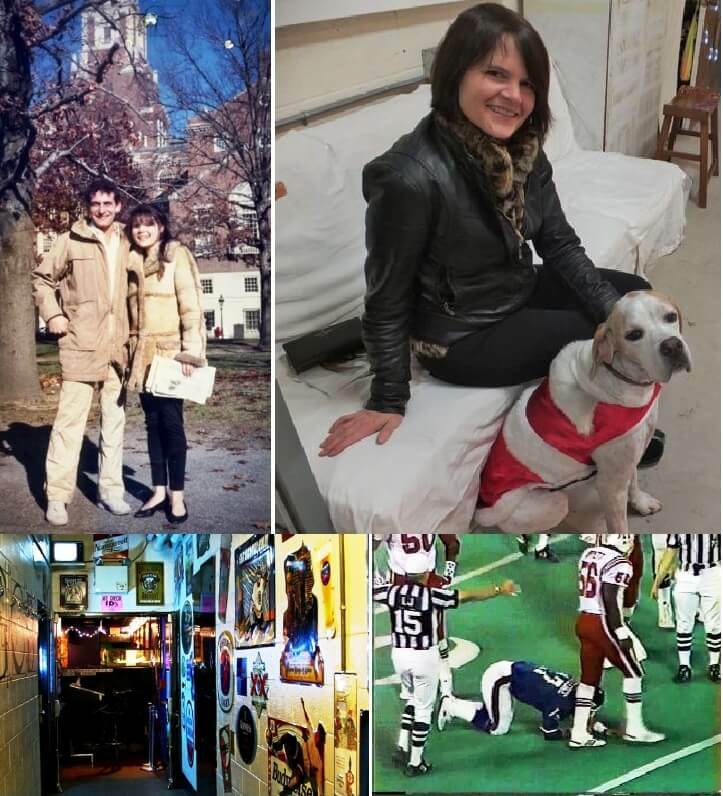 During Helen’s stay, we trekked to the far reaches of Narragansett Town Beach and also to The Temple to Music, Roger Williams Park in Providence. On the way back from Vermont, at McCoy Stadium in Pawtucket we watched a Pawtucket Red Sox game. 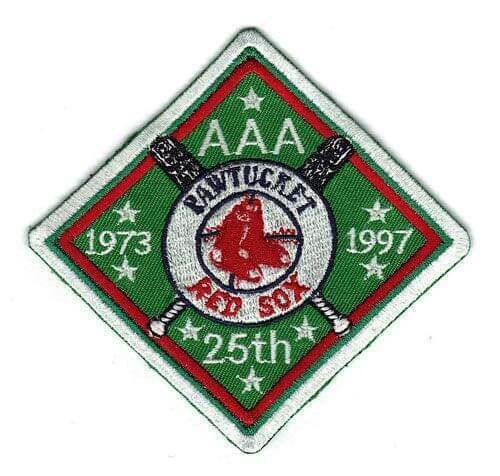 I bought a 25th anniversary patch, eventually lost. Reflecting on the trip and game, Helen says, “I certainly remember playing around next to the ocean. As for the game, I don’t remember who played or who won, but do recall David buying the cheesy patch. It’s sad to hear it was lost.” Befitting her love of the ocean, a few years ago Helen quit her job in Louisiana to live for three years on a sailboat in Portugal before moving to Brixen, Italy near the Austrian border.